EA is going to have one advantage for it's competition when Dante's Inferno launches next week - online co-op. Often rumored in God of War 3 which arrives a month later, Dante's Inferno will be getting an online co-op challenge mode for two players in the downloadable content pack called Trials of St. Lucia. Players can control either Dante or St. Lucia as you team up to take on custom missions created by the Dante's Inferno community. 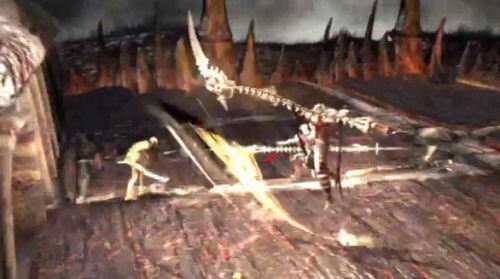 This missions appear to be of the survival variety as players can customize the types and number of enemies available for giant bone swinging scythe destruction. All of this information was leaked out in a trailer for the content. Now here's the bad news - it looks like the DLC isn't set to hit till April 29th, almost a full two months after the game's release, and a month after God of War 3 hits on the PlayStation 3. Still...we're excited after our fairly favorable impressions at last years PAX. We've pinged EA PR for any more details on the content and will update you if and when we have more information. Page created in 0.3882 seconds.